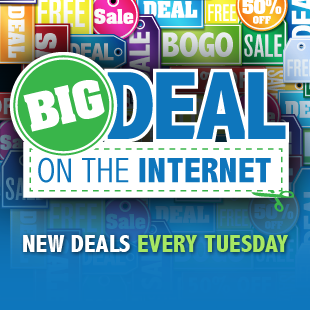 Welcome to "Big Deal on the Internet" - our weekly news post that brings you the biggest gaming deals across the internet every Tuesday. This is the week of Thanksgiving, er, Black Friday and just so we all have a little bit to be thankful for, due to popular demand from last week's Big Deal on the Internet post, we have a little section of UK PC Downloads for our friends across the pond. Today, we have the best prices on new releases Hitman: Absolution - Professional Edition and the PC version of Assassin's Creed 3. Or if you frugally abstain from new releases, there are a couple buy-somethin-get-somethin sales on used games from Gamefly and Best Buy worth checking out. Also notable: Mass Effect 2 is under the $10 mark. Amazon has a slew of $2 PC download offers that come with an extra $5 credit to be used on select download games in 2013. But be aware that the bonus credits can only be used one at a time, not in $20 or (who we kidding?) $50 chunks. In the 2-buck pool you'll find 4 SEGA Genesis Classics collections each with 10 titles. In hardware there are several solid 2ms monitor deals, Samsung 840 series SSDs up to $69 off next best price, and a Black Friday Dell XPS desktop that we found hidden but live on Dell's site. Today's release: Hitman: Absolution - Professional Edition (PC Download) - $32.50 at Green Man Gaming. Next best is $45. Deal expires November 22. Today's release: Assassin's Creed 3 (PC Download) - $39.99 at GameFly. Next best is $50. The Deluxe Edition is $63.99, elsewhere $80. Dec. 4: Far Cry 3 (PC Download) - $39.99 at GameFly. List is $50. Buy 2 Used Games, Get $12 Off (Xbox 360, PS3, Wii, Vita) - at GameFly. Buy 1 Pre-owned Game, Get 1 50% Off (Xbox 360, PS3, Wii) - at Best Buy. 5 PC Download Games for $10 - at GOG.com with 20 eligible titles including: Alan Wake's American Nightmare, Torchlight, Gemini Rue, and Trine. Today's release: Hitman: Absolution (Xbox 360, PS3) - $59.99 at Best Buy and comes with a $10 Gift Card. Elsewhere $60, no bonus. Today's release: Family Guy: Back to the Multiverse (PC Download) - $39.99 at GameFly. Next best is $45 at Amazon. Last Sunday's release: Disney Epic Mickey 2: The Power of Two (Xbox 360) - $49.99 at Amazon. Next best is $60. Max Payne 3 (Xbox 360, PS3) - $19.99 at Best Buy. Next best is $40 at Amazon. Deal expires November 21. Catherine (Xbox 360, PS3) - $19.99 at Amazon. Next best is $30 at NewEgg. Super Street Fighter IV Arcade Edition (Xbox 360, PS3) - $15.99 at NewEgg. Next best is $20 at Amazon. Deal expires November 21. Binary Domain (Xbox 360, PS3) - $14.99 at NewEgg. Next best is $22 at Amazon. Deal expires November 21. Soul Calibur V Collector's Edition (Xbox 360) - $24.99 at NewEgg. Next best is $34 at Amazon. Otomedius Excellent (Xbox 360) - $9.99 at NewEgg. Next best is $18 at Amazon. Deal expires November 21. Castlevania: Lords of Shadow (Xbox 360) - $9.99 at NewEgg. Next best is $25 at Amazon. Deal expires November 21. Mass Effect 2 (Xbox 360) - $9.66 at Amazon. Next best is $20 at NewEgg. Yakuza Dead Souls (PS3) - $14.99 at NewEgg. Next best is $23. Deal expires November 21. F.E.A.R Bundle (PC Download) - $14.98 at Green Man Gaming. Next best is $45. Deus Ex: Human Revolution (PC) - $7.99 at NewEgg. Next best is $12 at Amazon. Deal expires November 22. LEGO Batman (PC) - $5.99 at NewEgg. Next best is $12 at Amazon. Deal expires November 22. LEGO Harry Potter: Years 1-4 (PC) - $5.99 at NewEgg. Next best is $17 at Amazon. Deal expires November 22. Rage (PC) - $4.99 at NewEgg. Next best is $12 at Amazon. Hunted: The Demon's Forge (PC) - $3.99 at NewEgg. Next best is $16 at Amazon. Deal expires November 22. F1 Race Stars (PC Download) - $35.99 at GameFly. Next best is $41. F1 2012 (PC Download) - $19.99 at GameFly. Next best is $38 at Amazon. FIFA Soccer 13 (PC Download) - $19.99 at Amazon and comes with a $5 credit towards select downloads in 2013. Next best is $40 at Green Man Gaming. Deal expires November 24. Binary Domain (PC Download) - $8.99 at Amazon and comes with a $5 credit towards select downloads in 2013. Normally $40. Deal expires November 24. LEGO Star Wars: The Complete Saga (PC Download) - $7.99 at GameFly. List is $20. Burning Hot Bundle with Burnout Paradise: The Ultimate Box and Need for Speed: Hot Pursuit (PC Download) - $7.99 at Amazon and comes with a $5 credit towards select downloads in 2013. Next best is $36. Deal expires November 24. EA Sports Classic Pack (PC Download) - $3.99 at Amazon. List is $20. Aliens vs. Predator (PC Download) - $3.99 at Amazon and comes with a $5 credit towards select downloads in 2013. Next best is $15 at GameStop. Deal expires November 24. Dungeon Defenders (PC Download) - $2.99 at Amazon and comes with a $5 credit towards select downloads in 2013. Next best is $15 at GameStop. Deal expires November 24. Orcs Must Die! (PC Download) - $2.50 at GamersGate. Next best is $10 at GameStop. Ghostbusters: The Video Game (PC Download) - $2.49 at Amazon and comes with a $5 credit towards select downloads in 2013. Next best is $10 at GameStop. Velvet Assassin (PC Download) - $1.99 at Amazon and comes with a $5 credit towards select downloads in 2013. List is $20. Trine (PC Download) - $1.99 at Amazon and comes with a $5 credit towards select downloads in 2013. Next best is $20 at GameStop. Deal expires November 24. SEGA Genesis Classics Series Bundles 1-4 (PC Download) - $1.87 each at Amazon and come with a $5 credit towards select downloads in 2013. F.E.A.R Bundle (PC Download) - Â£9.99 at Green Man Gaming. List is Â£30. XFX FX797ATDFC Double D Radeon HD 7970 3GB GDDR5 PCIe Video Card - $329.99 at NewEgg and comes with redemption coupons for FarCry 3, Hitman Absolution, Sleeping Dogs and Medal of Honor WarFighter Limited Edition. Next best is $350 at TigerDirect. Deal expires November 21. Asus Radeon HD 7850 2GB GDDR5 PCIe Video Card HD7850-DC2-2GD5-V2 - $179.99 at NewEgg and comes with redemption coupons for FarCry 3 and Medal of Honor WarFighter Limited Edition. Next best is $210 at JR.com. Deal expires November 21. Asus VE278Q 27-inch 1080p 2ms LED Monitor - $249.99 at NewEgg. Next best is $280 at TigerDirect. Deal expires November 21. Hannspree HF255DPB 24.6-inch 2ms LCD Monitor - $159.99 at NewEgg. Next best is $164 at Mac Mall. Deal expires November 21. Samsung S24B750V 24-inch 2ms LED Monitor + $40 Gift Card - $229.99 at NewEgg. Next best is $300 at Amazon. Deal expires November 21. Dell Alienware OptX AW2210/1FX9D 21.5-inch 1080p 2ms LCD Monitor (Refurbished) - $149.99 at NewEgg. List is $300. Samsung 840 Series SSD 2.5" 500GB MZ-7TD500BW - $299.99 at NewEgg. Next best is $369 at B&H Photo. Deal expires November 21. Seagate Momentus XT 500GB 7200RPM Solid State Hybrid Drive ST95005620AS - $49.99 at NewEgg. Next best is $90 at TigerDirect. Deal expires November 21. Samsung 840 Pro Series SSD 2.5" 256GB MZ-7PD256BW with Assassin's Creed III Game Coupon - $256.49 at NewEgg. Next best is $268 at Amazon. Deal expires November 21. Samsung 840 Pro Series SSD 2.5" 128GB MZ-7PD128BW + Assassin's Creed III Game Coupon - $139.49 at NewEgg. Next best is $149 at B&H Photo. Deal expires November 21. HP ENVY Phoenix h9-1340t Desktop, Ivy Bridge Quad Core i7-3770K, GeForce GTX 660 1.5GB, 12GB RAM, Windows 8 - $1,124.99 at HP. List is $1,500. HP ENVY Phoenix h8-1440t Desktop, Ivy Bridge Quad Core i7-3820, Radeon HD 7570, 10GB RAM, Windows 8 - $749.99 at HP. List is $1,000. Dell XPS 8500 Ivy Bridge Quad Core i7-3770, Radeon HD 7570, 8GB RAM, 1TB HDD, Windows 8 - $699.99 at Dell Home. List is $844. Acer Aspire AM3970-UR14P Ivy Bridge Core i5-3450, 8GB RAM, Radeon HD 7570 - $449.99 at TigerDirect. Next best is $715 at Walmart. Lenovo IdeaPad Y500 95412ZU Ivy Bridge Core i7-3630QM, 16GB RAM, 1TB HDD + 16GB SSD, GeForce GT650M, 1080p Full HD, Blu-ray, Windows 8 - $1,149 at Lenovo. List is $1,599. Lenovo IdeaPad Y500 95412SU Ivy Bridge Core i7-3632QM, 8GB RAM, GeForce GT650M, Windows 8 - $849 at Lenovo. List is $1,149. Lenovo IdeaPad Y400 95232FU Ivy Bridge Core i7-3630QM, 8GB RAM, 1TB HDD + 16GB SSD, GeForce GT650M, Windows 8 - $799 at Lenovo. List is $1,349. Lenovo IdeaPad Y400 952324U Ivy Bridge Core i5-3210M, 8GB RAM, GeForce GT650M, Windows 8 - $749 at Lenovo. List is $999. Mad Catz Xbox 360 Wireless Racing Wheel - $119.99 at Buy.com. Next best is $150 at Overstock.com. Deal expires November 26. Playstation Move Starter Bundle with Just Dance 3 Voucher (eye camera, controller) - $39.99 at Amazon. Next best is $70 at NewEgg. Wii Console Bundle w/ Just Dance 4 - $129.99 at Best Buy.